MONTREAL (AP) -- Lleyton Hewitt quit during his opening match at the Rogers Cup on Tuesday, weakened by a stomach ailment that forced him to retire for only the second time in his singles career. The second-seeded Australian was trailing French qualifier Florent Serra 4-3 at the time in the ATP Masters Series tournament. Top-seeded Rafael Nadal needed three sets to down fellow Spaniard Carlos Moya 6-3, 6-7 (0), 6-3 in a match that lasted 2 hours, 40 minutes in sweltering heat. Nadal had a break late in the third set to go ahead 5-3 before serving out the match. Moya saved 13 of 15 break points in the match. Nadal called out the trainer at 2-2 in the third set, and the match was delayed about 10 minutes for treatment on his left forearm. 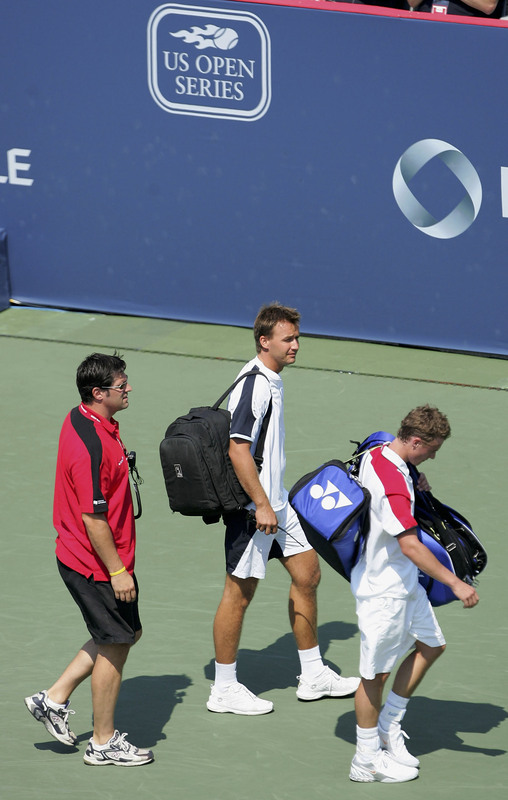 Hewitt has played 504 singles matches, and the only other time he quit was in July 1999 at Los Angeles because of an ankle sprain while facing Andre Agassi in the quarterfinals. This was Hewitt's first on tour since the Wimbledon semifinals July 1. Since then, he played in Australia's loss to Argentina in Davis Cup and got married. Hewitt has played sparingly this season after foot surgery in the spring. He then missed the French Open after cracking two ribs when he fell down stairs at his Sydney home. Yet, he won the Sydney title and reached two other finals, including the Australian Open. Two other seeded players lost -- No. 13 Ivan Ljubicic and No. 14 Radek Stepanek. Ljubicic was beaten 1-6, 7-5, 6-3 by Taylor Dent, and Stepanek was ousted by Robin Soderling 6-3, 6-4. No. 12-seeded Thomas Johansson cut down big-serving Ivo Karlovic 6-1, 7-5, and Nicolas Kiefer, a two-time semifinalist at the Rogers Cup, beat Nicolas Massu 6-3, 6-2. Massu has yet to win at the Rogers Cup in three appearances. Younes El Aynaoui won his first match since 2003 when he beat Wimbledon quarterfinalist Feliciano Lopez 7-6 (3), 6-3. El Aynaoui finished 2003 in the top 20 for the first time. But after retiring from the 2004 Australian Open with an ankle injury, he didn't appear on tour until last August, and lost a string of first-rounders. In other first-round matches, Jiri Novak defeated Igor Andreev 6-4, 6-7 (1), 6-1, and Tomas Berdych topped Jurgen Melzer 6-1, 6-3.